I am writing this letter because it felt strange to leave without saying goodbye. I want you to know that it is not because of anything you did or did not do, but simply because it is time to move on. I will always carry a part of you with me wherever I go. I have only the greatest respect for you and I have been forever changed by knowing you. I hope that you will not be angry with me, although I accept that you will need to deal with this in your own way. You may not even notice that I am gone. I still can’t help but hope that you are sending me off with a happy heart and wishes for safe travels. as artists, and as human beings, what kind of space do we create? i am running not quite as early as i want again today. but at least i did a pretty thorough vocal warm-up beforehand. maybe it is something about the Robot Immigrants coming to the Armory today and meeting with them after, but my warm-up was similar to the ones we do in our process. usually i do yoga because my body tweaks out a little sitting on that stool in one position for so long, but yoga hasn’t quite been solving that in its entirety. although i am building my core back up so that i can sustain the position (and minimize the pain and damage to my body), i realized from the last Event that i needed to work out my articulators a little more to maintain the extended verbal space that i am filling. so my warm-up today actually became a combination of both physical stretching and releasing, and voice warming and exercising. working a shift at night is a totally different feeling. you would think that i would be used to it, having worked in bars and clubs for so many years that i can’t even count the number on both hands. but even after all this time, it is still easier for me to get it together and get to places on time (early, even) in the morning. at the end of the day, i struggle. perhaps it’s due to the accumulation of energy. maybe depending on how you use it during the day, you’re either slower and more tired, wanting to crash on the couch or you’re amp’d up, full of life and want to expend some of that energy being with your friends and letting loose. while i’ve mostly lived a life of the latter, it feels that these days my body craves the kind of life where i am up with the sun and resting when the creatures of the night make their debut. Timelessness. Universality. Interconnectedness. Joyfulness. Simplicity. today was my very first shift at the Armory. amidst the chaos of my final week of the Fall semester in grad school, the holiday hubbub, subway delays, and too little time for the important things, i trekked my way up to the Upper East Side to read to the pigeons. i could not be more grateful. upon arrival, i am filled with a sense of calm and expansiveness. there aren’t too many people in the Drill Hall. i see the familiar little heads of J.Ed and Deborah Black emerging from their intricate sheep’s wool cloaks. it is quiet and mellow. some people are laying on the floor beneath the curtain. others are slowly swinging in what seems like quiet contemplation. i want to join them, but i head back to the green room instead. it’s nice back there too. because we are instructed to show up 20 – 30 minutes before our shifts, i have time to stretch to make up for the yoga that i didn’t have time for in the morning. prior to this, i had a Kanji quiz and a taped in-class Japanese presentation. learning a new and complex language is difficult; communication in any language takes a great deal of energy in order to articulate oneself well. this November i was invited by Anne Bogart to participate as a reader in Ann Hamilton’s installation event at the Park Avenue Armory. as both a great honor and delight, i am reading to pigeons alongside members of SITI Company and their affiliates. the selected texts are from writers such as Aristotle, Charles Darwin, Ralph Waldo Emerson, William James, and more. 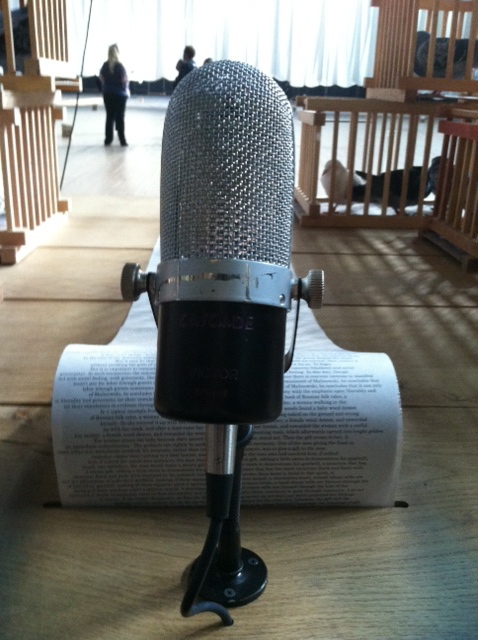 these readings address a shared consciousness about our existence and our voices are transmitted via paper bag radios carried throughout the space. my participation is but one element amidst the vast participatory landscape that Ann Hamilton has so care-fully created. the following entries are an attempt to understand and share this intimate and meaningful experience with you.